Not every rookie shines during rookie tournaments, but there were a few pleasant surprises in a Colorado Avalanche uniform this past week at the Vegas Rookie Faceoff. As a whole, the Avalanche only won a single matchup in the three-game tourney but they showed resilience and some interesting player combinations. But rookie tournaments aren’t as much about the score as the players. For Avalanche fans, it may be good Colorado didn’t win all their games. They had a very strong showing two years ago before the dismal 48-point season. The Avalanche struggled last year and went on to have a great season. Rookie camp is more about development and players’ progress anyway, not that a win isn’t valuable. Four bubble players made surprisingly good impressions over the course of the long weekend outside of the prime candidates. Each one came into camp with some questions. All of them had strengths and weaknesses but their overall performance was surprisingly good. The former OHL Hamilton Bulldog surprised everyone with his gritty play and his nose for the net. The moderately sized center elevated the play of his linemates and scored two goals in the final game, notching five goals for the tournament. He was opportunistic in finding rebounds and getting them in the net, a skill the Avalanche need. Saigeon does not have a contract as of yet, so it will be interesting to see what the organization does. Colorado already signed 47 of their 50 allotted contracts, and they will likely want to call up Cale Makar and Shane Bowers next spring. Offering Saigeon a contract will cost the Avalanche their last open contract spot, a position that hasn’t worked well in the past. 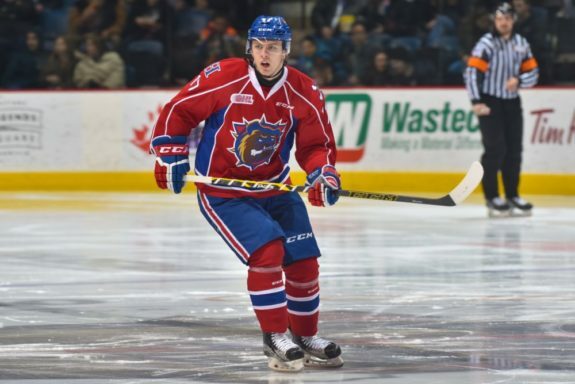 Background: Saigeon spent the last three years playing for the Hamilton Bulldogs. He improved each season, culminating in a 70-point (35 goals, 35 assists) regular season over 65 games and an additional 25 points (18 goals, 7 assists) in 21 OHL playoff games. The former DU Pioneer surrendered his role as team captain to sign with Colorado. He came onto the scene with some question marks after a good but not stellar college career. During the tourney, O’Connor, a forward, played a smart game, effective in breaking through to scoring chances, without making a lot of costly turnovers. He did a good job falling back on defense and had no problems battling for the puck. One could see why the Avalanche signed him to an entry-level contract this summer. Background: O’Connor spent the last three years playing for the Pioneers, earning 43 points over the course of 108 games with the team. He helped the Pioneers to win the NCAA championship his sophomore year and made it to the NCAA quarterfinals last year. His father played 43 games in the NHL. The Russian forward improved with each game. He seemed to pick up speed as the tourney progressed and he showed slick passing skills and a fiercely competitive streak. Not afraid to get physical, Shvyrev exhibited good puck awareness to go with solid skating. He really shined once he was moved to center, where he took the lion’s share of important face-offs, as well as showcasing his solid two-way play. For a fifth-round pick, he looked like a steal. Background: Shvyrev (also spelled Shyvryov) suited up for 32 games in the KHL last year, playing for Metallurg Magnitogorsk, as well as participating in three playoff games for the team. He was also named as an alternate to the Russian U-20 team. During his time in the MHL (the Russian equivalent to juniors), he earned 133 points in 113 regular season matchups and 12 points in over the course of 20 playoff games. The Russian defenseman missed all of last season after a preseason shoulder injury sidelined him. But he returned from injury with a vengeance. Boikov played top pairing minutes on the blue line, was scrappy in the corners, and was easily the best defenseman on the ice for the Avalanche. Boikov used his physicality to open up spaces on the ice and cause turnovers. He did an effective job distributing the puck and keeping it in the offensive zone on the power play. At one point, Boikov was on the ice for over three minutes on consecutive power plays, guarding the blue line and keeping the puck in the offensive end of the ice. His ability to jump in and feed the offense even got him an assist. Having another quality young defenseman in the pipeline for the Avalanche offsets the temporary loss of Conor Timmins. Background: Boikov missed all of last season with shoulder surgery. In the previous year, he played with the San Antonio Rampage and the Colorado Eagles, making 18 playoff appearances for the Eagles where he tallied 10 points, earned 12 penalty minutes and finished with a plus-three in their Kelly Cup run. 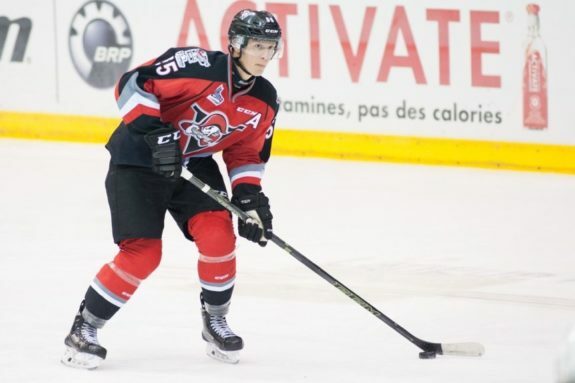 In 2015-16, he helped his QMJHL Drummondville Voltigeurs to the playoffs and played for Russia in the World Junior Championships. Vladislav Kamenev, the Russian forward who should be aiming to make the Avalanche this year, improved as the tourney progressed as did first-round draft pick Martin Kaut. Kaut definitely looked like he could use some time in the AHL to fine tune his game. Goaltender Petr Kvaca rebounded from a disappointing performance in the first game to a quality showing in the third contest, including a spectacular save. Justus Annunen put forth a surprisingly good debut for a young goaltender. Forwards Ty Lewis and J.C. Beaudin looked ready to compete for starting spots with the Colorado Eagles while Nicolas Meloche played a solid defensive role and could compete for the seventh or eighth slot on the Avalanche blue line. Five skaters on Amateur Tryout Contracts (ATO’s) were given opportunities to prove their value. Their performances were not inspiring but they could very well provide value in a depth role with the Eagles or perhaps a more active spot in the ECHL with the Utah Grizzlies. One additional note – the Avalanche rookies spent a lot of time in special team situations, playing on either the penalty kill or the power play. The penalty kill units were uneven at best, either turning over the puck in their own zone or not covering the net as the goaltender made a save in the opposite corner. A number of players were sloppy with their stick work, getting beat by other players, and earning penalties. 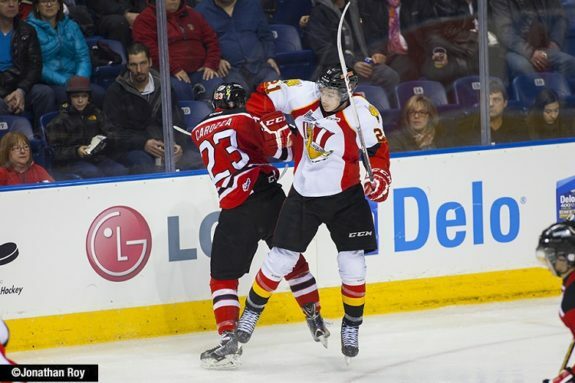 Defenseman Josh Anderson stuck out in a bad way, especially as he frequently seemed to be looking for a fight. Kaut earned his fair share of calls, one of the reasons a stint in the AHL may be a good fit for him this year. It worked for Mikko Rantanen. The forwards also had the occasional letdown. In particular, they needed to do a better job of capitalizing when on the man advantage. By the end of the tournament, they had improved at keeping the puck in the offensive zone. Overall, though, they needed to get more quality shots. And they definitely needed to seize the opportunity to score on the two-man advantage, which was a noticeable misstep. Overall, the rookies showed skill and talent as well as proving they have room for improvement. But that’s what rookie tournaments are all about. Showcase strengths, reveal weaknesses, and develop strategies to help the players improve. The Colorado Avalanche should have a plethora of information to sift through. Now the trick is to see how well the organization develops the talent they have.